Καθολικός διάκονος: "Her sin is her lifelessness"
"Her sin is her lifelessness"
In today's Gospel reading prayer and faith are inextricably linked together by Jesus himself. It seems fitting to hear this teaching during the month we dedicate in a particular way to praying the Rosary more and more intensely. 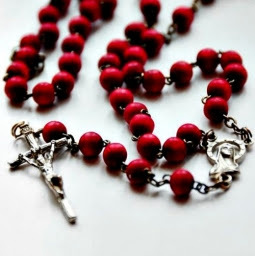 The Most Holy Rosary of the Blessed Virgin Mary isn't merely one means among many we have at our disposal to pray always, but a major means to pray persistently, to call out night and day, entrusting to the unique and irreplaceable intercession of the Blessed Virgin our petitions and prayers, our hopes and aspirations, our worries and our cares. I think sometimes, like those to whom our Lord addressed the teaching the Church addresses to us today, we worry that we're pestering God, bugging him, by praying each day for many of the same things over the course of weeks, months, years, or even decades. I think parents, like St. Monica, are especially prone to repetitive prayers on behalf of our children. Perhaps, like St. Paul, we experience some thorn in our flesh, some need, that drives us to God. Jesus doesn't only tell us not to worry about pestering God, he urges us to persist in so doing. By entrusting our prayers and petitions to the intercession of our Blessed Mother we can be confident our prayers are heard. Because the month of the Rosary precedes the month during which we remember our beloved dead, which month begins on All Hallows eve, followed by the solemnity of All Hallows and All Souls, I would add that praying through the intercession of the saints, too, is another expedient and important means we have of praying always and doing so from within the communio sanctorum. Our reading from 2 Timothy tells of the importance of knowing the Scriptures. One way of knowing the Scriptures from the inside is to practice lectio divina. This passage from 2 Timothy also tells us why it's important to know the Scriptures: they "are capable of giving you wisdom for salvation through faith in Christ Jesus" (2 Tim 3:15). It bears repeating often - even as Catholics- we're saved by grace through faith in Jesus Christ. But faith cannot be a passive endeavor, something as slight as giving mental assent to a proposition. Faith is not a non-binding resolution that we merely ratify. Because it requires living in such a contradictory manner, faith requires the wisdom that we can only receive through divine revelation. Jesus is the deliverance God wrought and has brought. We, reborn through baptism, are the descendants who serve God. Prayer is a service to God and others. It is the way love of God and love neighbor are fused together, which is why prayer and faith are inextricably bound together. Traditionally, on Sundays we pray the Glorious Mysteries of the Rosary. The fourth Glorious Mystery is the Blessed Virgin's bodily Assumption into heaven. The fruit of this mystery is the grace of a happy death. It's difficult for me to imagine a happy death without prayer. When the Lord returns, whether it's to definitively establish God's reign, or merely to bring us to himself, will He find faith? Too often the biggest obstacle to prayer is setting aside time to do it and, when the times arrives, to actually pray. In concert with what Bob Dylan sings about Shakespeare's Ophelia in his epic song "Desolation Row," you can only keep your eyes fixed on Noah's rainbow while peeking into desolation row. Why else do you think we pray to the Blessed Virgin: "To thee do we cry, poor banished children of Eve: to thee do we send up our sighs, mourning and weeping in this vale of tears"? Prayer is the language of God's kingdom. Fluency in prayer is the only way we can dwell there happily. God's kingdom is not just a community; it's a communion. In God's kingdom we can only speak what is true, good, and beautiful. It's where we're known as we've always longed to be known. This is why the first step of prayer is rid yourself of all dishonesty, pretense, and superficiality. Baring your soul through prayer not only to God, who is Father, Son, and Holy Spirit, but to our Blessed Mother and the saints is an important language lesson, the way you already belong where you hope to dwell forever.